♥ ♥ ♥ TUKRU LOVES YOU. 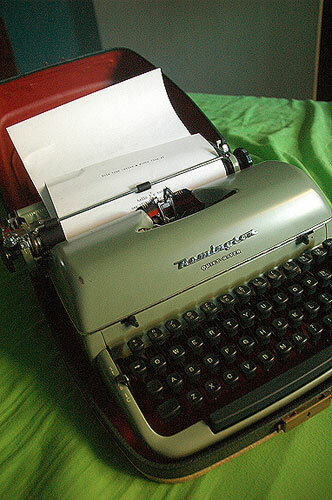 ♥ ♥ ♥: NEW TYPEWRITER. last sunday carl spotted a typewriter in the oxfam he works in, and i kinda made him get it for me. he was too knackered to carry it home on wednesday (the next time he was working) but he put it aside, and today he carried it home. the carry handle actually broke half way here and it rolled down the street by sainsburys. 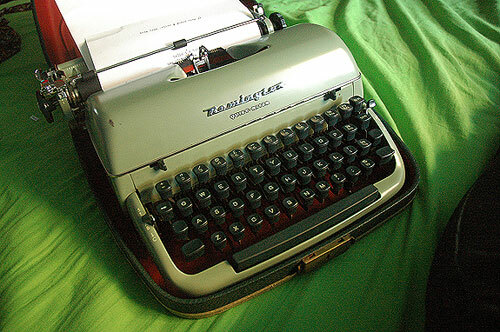 it's fine though, and it's quite possibly the best typewriter i've ever had. it's my fourth or fifth one, not including carl's typewriter. the old ones were left back home when i moved here, and i think my mum's got rid of all of them but one, a pretty little baby blue portable one i got at a fleamarket. she's chucked my favourite one though, the electric one i got from my school for free because they didn't use them anymore. i just had to buy a new cartridge for it. i miss it cos it had a different typeface. nice to have a variety. 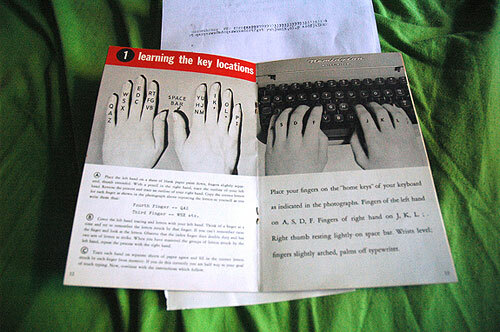 i really want one of those cursive ones though.. i'm sure ciara has one and every time i read her zines i get typewriter envy. 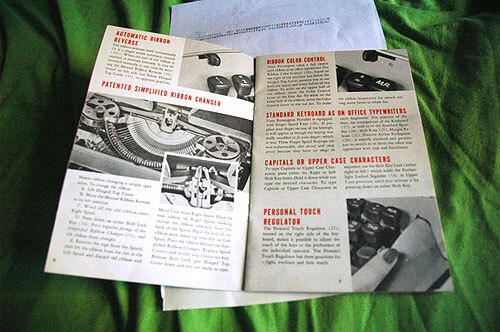 it came with an instruction book, and someone's old practise sheets. ace. i'm almost finished with your pretty face #10, i'm not sure if she's gonna make its debut until #11. i've got pretty much all the pages planned, i actually did a couple again today, probably gonna continue a bit later. That's such a pretty typewriter! She looks like a Nora, or an Edith. 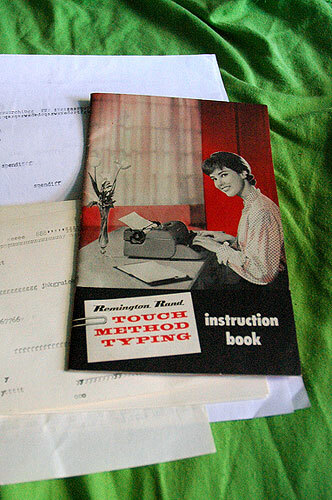 i don't know if 100% cursive typewriters actually exist--maybe! 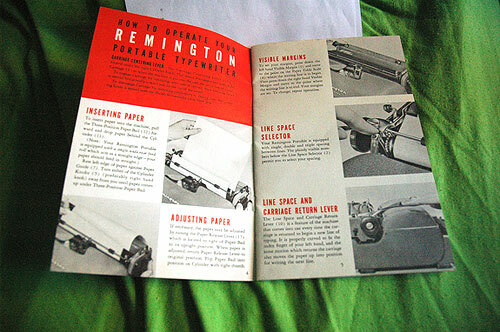 but what i have is a typewriter with a removable font wheel. i can pop it out & replace it with a cursive font wheel. pretty awesome, huh? one typewriter, two different fonts to choose from. i think the company makes other font wheels as well. 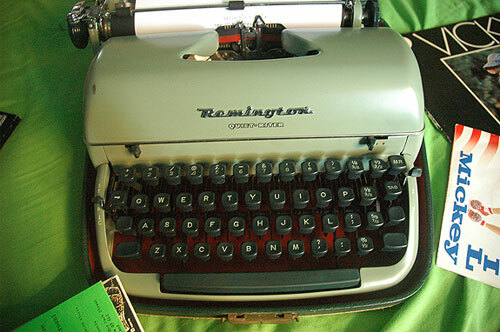 i bought my typewriter off ebay (i am obsessed with one particular electric model & have been using it since the mid-90s--i've gone through four typewriters in that time, all the exact same model) & the person i bought it from threw the cursive font wheel in as a freebie. i was excited!